One of the most famous plays in history, The Crucible recounts a dark period in American history: the Salem witch trials. 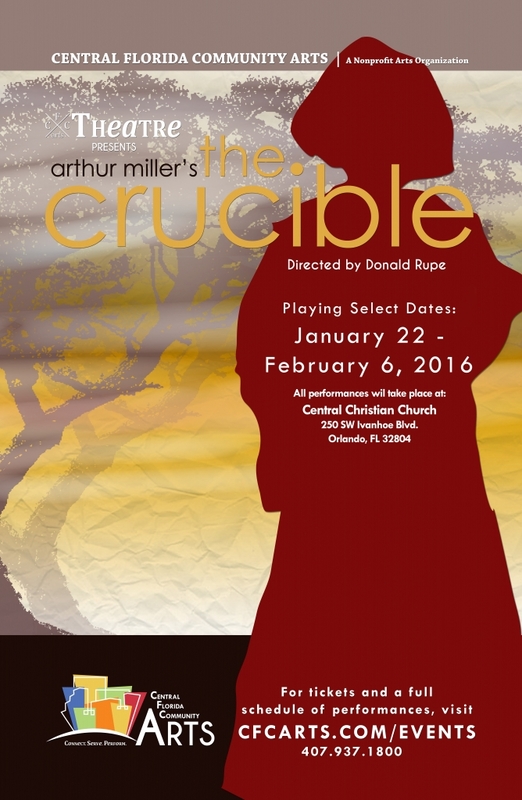 A drama that explores the historically accurate events that took place in Salem, Massachusetts, The Crucible is a different kind of a production for Central Florida Community Arts, and as always, audiences can expect an inventive staging of Arthur Miller’s classic work. This play may not be appropriate for all audiences. The Crucible will be held at CFCArts’ Central Campus, which is housed on the grounds of Central Christian Church, 250 SW Ivanhoe Blvd. Orlando, 32804. Please park behind the church, going around the left side of the building, and taking care to turn before I-4 entry ramp, which is next to the church’s driveway. Seating for all The Crucible shows is limited and advanced purchase is strongly recommended. Guaranteed seating can be purchased in advance for $15 (credit card/Paypal) or, if available, can be purchased for $18 at the door. Tickets for Industry Night are just $12! Doors open 30 minutes before show time and all seating is general admission.